Announced years ago, under design works from 2008 and then under construction from 2011. 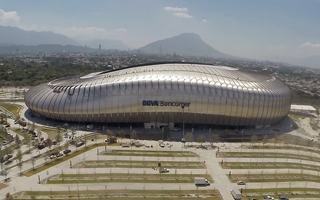 Then with delayed delivery, this stadium tested the patience of CF Monterrey fans. But eventually it got built just in time to celebrate the club’s 70th anniversary, by the end of July 2015. A few hours after we publish this article the new arena will see its first game, between Monterrey and Portuguese side Benfica. Just yesterday the building was formally opened by Mexico’s president Enrique Peña Nieto. Estadio de Futbol de Monterrey or Estadio BBVA Bancomer, as it’s commercially known, is the largest and most modern stadium in Mexico built and operated entirely privately. It’s the outcome of joint venture between CF Monterrey and beverage giant FEMSA, but since FEMSA also own CF Monterrey, it’s really their project. From start to finish declared price stood at $200 million. We were unable to verify if this budget was met, especially taking into account changes in design and schedule done during the process. That said, since it’s a private project, any possible overruns do not fall on taxpayers. Somewhat ironically, the new Monterrey stadium isn’t located in Monterrey. It stands in Guadalupe, eastern part of the agglomeration. In the west it borders local zoo, in the east it neighbours low-rise residential/commercial district. It’s not an accidental spot, but part of a growing leisure destination, something which the stadium should further improve. Aside from Liga MX games it was designed with 2-4 concerts annually in mind. Nominal capacity is set at 51,000 and that’s a great leap from Estadio Tecnológico’s 32,000. Also a leap in terms of quality as spectator amenities are unmatched nationwide. One change football fans will enjoy is being closer to the players: 9 meters instead of 27 separate spectators in the first row from the playing field. Of course that’s the distance in lower tier, only one built in a sunken bowl. And while we’re at hospitality, Estadio BBVA offers 324 skyboxes (9-12 people). According to architects at Populous, it's more than any other stadium worldwide. This is hardly true as even in Mexico the national Estadio Azteca has more. Still, compared to stadium capacity the percentage of luxury suites in Guadalupe is indeed amazing. The boxes alone hold over 3,200 people, while further 4,500 business seats can be find in the lower tier seating. Aesthetically the stadium is a mixture of seemingly unconnected ideas. Vast use of aluminum tinware across the façade and roof is said to honour Monterrey’s steelwork industry traditions. And the tin-covered and crescent-shaped arena is also somewhat reminiscent of a beer still, another thing the city is known for. However, to a passerby the stadium will be none of those associations. It seems to be very organic, almost a live organism, owing to the rhythm of segmented façade and overall dynamic shape changing appearance depending on sunlight. One distinctive feature this vivid building includes is a long row of perforations resembling gills. And those in fact are gills as they offer access of fresh air (and sunlight) to the vast infrastructure behind Estadio BBVA façades. Aside of the stadium itself (footage of 187,000 square meters) the entire plot (24.5 ha) also includes 3,600 parking spaces. And instead of offering only car bays, the parking is planned as a public green space. Sections of the parking are divided with green areas which collect rainwater. This way the parking gets cooled faster and allows for tree growth to provide shade upon stadium access.